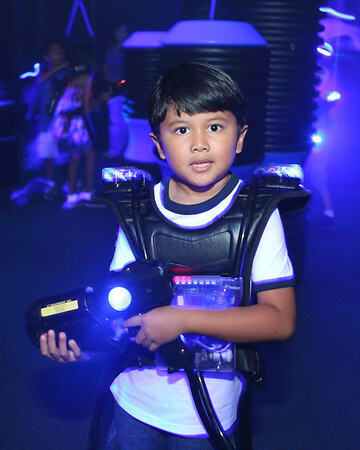 Call of Duty: Black Ops trained my son well in the art of LaserStrike Laser Tag at the Ice Sports Forum. Aggressive youthful visions of dual wield LaserTron LT-11 phasers came to mind with full auto capability but were halted by silly LaserStrike game rules. 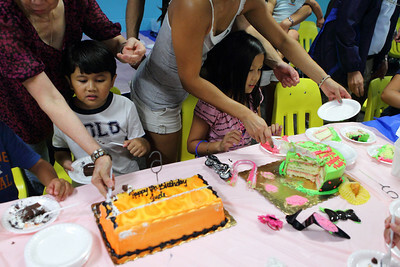 The only dual wielding going on was the double Birthday Party of my son and daughter at The Ice Sports Forum. Double Birthdays means dual cakes. 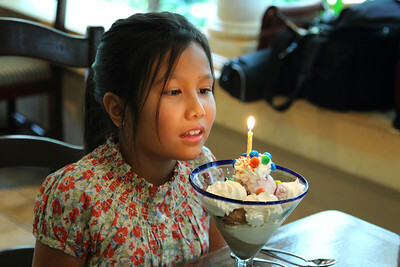 Two Happy Birthday songs followed by two candle blowing wishes. More the merrier, right? At least we can have boys versus girls LaserStrike Laser Tag competitions. As my son says, "Boys rule, girls drool." Like any good strategy, my daughter's defense is a secret Weapon of Mass Destruction. These WMD's are filled with hormonal rage armed with pink phasers. A deadly combination to say the least. 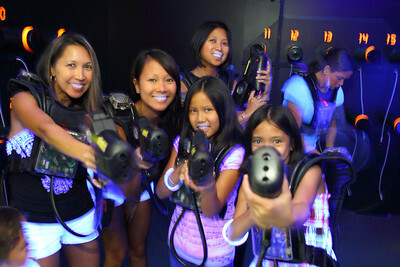 Double cakes, Pizza, Wings and reams of soda pop were not enough to fill the hungry appetites of Laser Tag gamers. My wife made even more sugary treats on top of all yummy goodness. 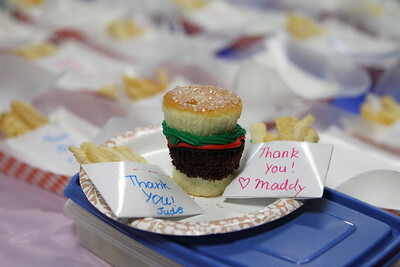 Cheeseburger Cupcakes are all the rage. Vanilla cupcakes for buns and chocolate cupcakes for hamburger meat. You cannot forget the condiments. Red icing for ketchup, flattened yellow icing for cheese,green icing for relish, sugar crystals for sesame seeds and too top it all off, french fries made out of sliced sugar cookies. Yummy! 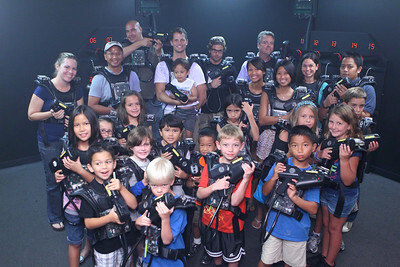 You can view more photos shot with the Canon EOS 1D Mark IV paired with the Canon EF 24-70 f/2.8L lens in my Maddy and Jude's Laser Tag Birthday Party 2011 Gallery. The streets and highways will soon have one more driver on the road exercising her teenage independence. Just like every anxious newly turned 15 year old, my niece is brimming with anticipation to get behind the wheel of her new ride. A new ride to school, a new ride to the movie theater, a new ride to Sunday Church and eventually a new ride to college. Your loving jealous brother will be further envious of your aged accomplishments. My son will be looking forward to his ride to GameStop, for the latest edition of Call of Duty: Black Ops 2. Just like old times, you can share a new ride with all your loving cousins to your old watering hole for some ceramic pottery fun. The family could always use more personalized unsafe microwave dishes to decorate the kitchen shelves. 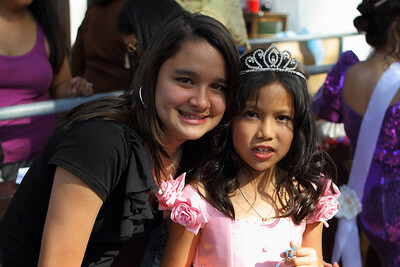 Your younger cousins look up to you as their oldest and most wise young adult in the family. Role model is an understatement. Your favorite Auntie brought you a newborn cousin, Serena, to your growing list this year. A new ride to babysitting your youngest cousin is in your future. Your new ride will never run empty. It will be fueled by all the love of your family including your Mom in Heaven. Consider that limitless 24 hour Roadside Assistance from up above. Happy Birthday Libby! We all love you very much. My son and I got close and personal with his new watery friends. A recent trip to the mall landed him another chapter in his quest for an ideal family pet. There were Clown Fish, then Gold Fish, recently Beta Fish and now Sea-Monkeys. Like packets of sugar poured into my much needed morning coffee, my son anxiously ripped the pouch of Instant Live Eggs into the supplied red aquarium. 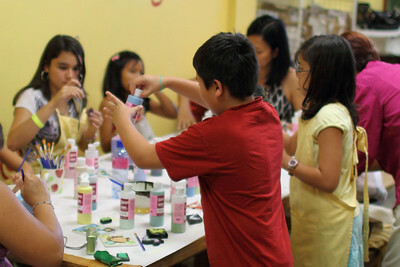 Then came the waiting and more waiting for the "Amazing Live Sea-Monkeys" to come alive. 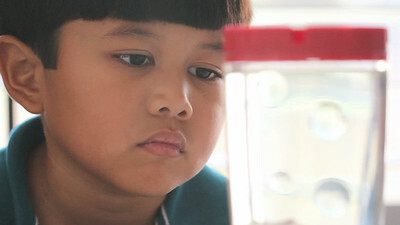 Days passed and hope was slowly diminishing, the encapsulated Brine Shrimp Eggs hatched and the Sea-Monkeys came to life. With the eyes wide open stare of my son, the almost microscopic newborn animals circled with random beauty. 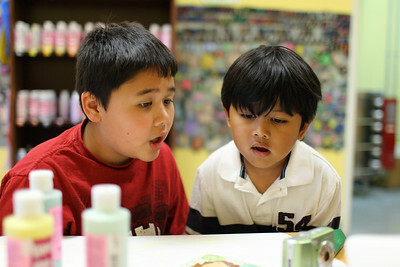 I shared the same amazement and captured the moment on video with my Canon EOS Rebel T3i paired with the Canon EF 100mm f/2.8L IS Macro lens. Combined with the lens and the Full HD Digital Zoom feature of the T3i/600D, my son and I got close and personal with his new aquatic friends. See more Canon Rebel T3i/600D photos, videos and related hyperlinks in my Canon EOS Rebel T3i/600D Video Test Gallery. 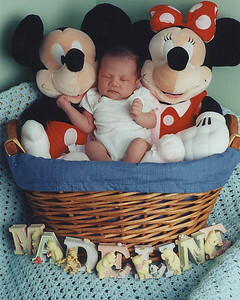 Happy 9th Birthday Madeline ! 9 years old and counting. Father time is ticking until your Confirmation, then your Driver's Permit and then your High School Graduation. On top of all the family events in between milestones. The petabytes of future photos and videos are staggering to imagine. Hopefully by then, they will have a 1 gigabyte Apple iPad 10 available at a premium price. Of course, replaced with a better upgrade 6 months later. 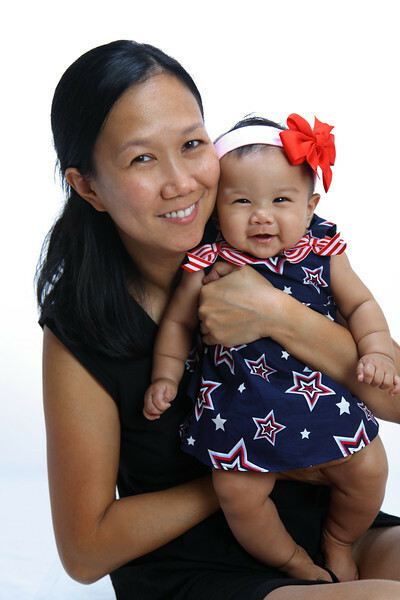 From newborn photos shot with the 35mm film Canon EOS 3 camera 9 years ago, SLR technology has changed dramatically with the times. Hauling separate still and video cameras in the past are now replaced with hybrid HD DSLR's that can achieve both with stunning Full HD quality. My daughter can only look forward to smaller, faster, better and cheaper imaging technology in the near future. Anyone interested in a mint 35mm film camera with battery booster? 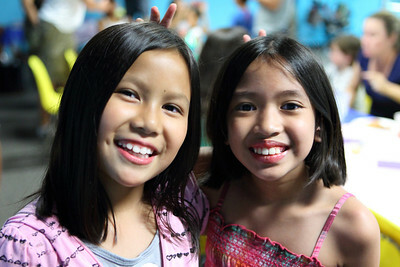 A summer birthday welcomes a celebration with extended family at a local swimming hole. 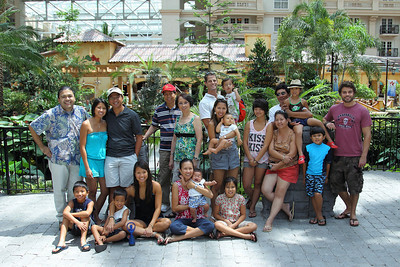 Local meaning Gaylord Palms Resort in Orlando, Florida. Luckily, a housekeeping fiasco kept each room a long and comfortable distance from each other. Thank you very much kind random acts of fate! 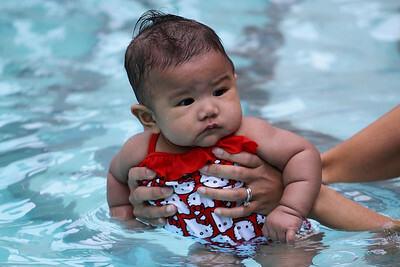 From Holy Water to swimming pool water, my newly Baptized baby daughter has grown accustomed to her sea legs. Just like her big sister, newborn Serena loves Hello Kitty! Call of Duty Black Ops has trained my son well in the art of water warfare. 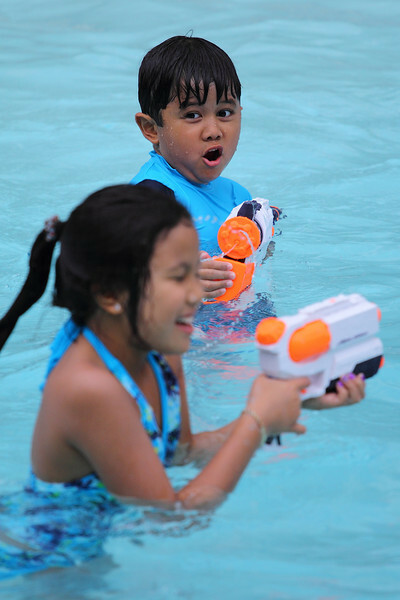 The NERF Super Soaker is like an extension of his arm unleashing aquatic surgical strikes against older annoying sisters on their birthday including innocent bystanders. You can view more in my Happy 9th Birthday Madeline Gallery shot with the Canon EOS 1D Mark IV paired with the Canon EF 24-105mm f/4L IS and EF 70-200mm f/4L IS II lenses. This is a 1080p video shot with the Canon EOS 1D Mark IV paired with the Canon EF 24-105mm f/4L IS and EF 70-200mm f/4L IS II lenses. Edited with Final Cut Pro 6.0.6 and used Compressor to get a 422mb H264 video file at best quality. I used the Canon E-1 Movie plugin to transcode the h264 movie clips to AppleProRes422. For audio, I used the budget priced AZDEN ECZ-990 Supercardioid Shotgun Microphone. 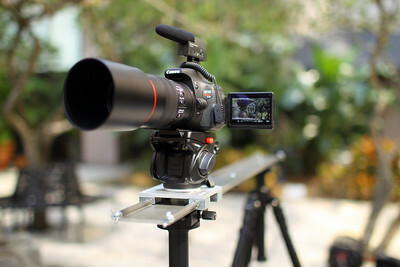 Stay updated with the latest HD DSLR gear by becoming a Fan on my Facebook Fan Page and following me on Twitter. 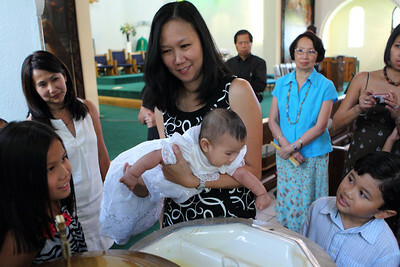 The countdown to the seven Holy Sacraments begins with the Baptismal affusion of my daughter Serena. Reconciliation, Holy Eucharist, Confirmation and the list goes on and on. Dark cavernous halls of Catholic Churches with four types of mixed light sources plague my Baptismal photography as well. It is hard to believe Original Sin flows through Serena's wonderful smile before the Holy Water soaks her head. With three pours of water gives me three chances to capture the moment. In the Name of the Father, click. Son, click. And the Holy Spirit, click,click,click. 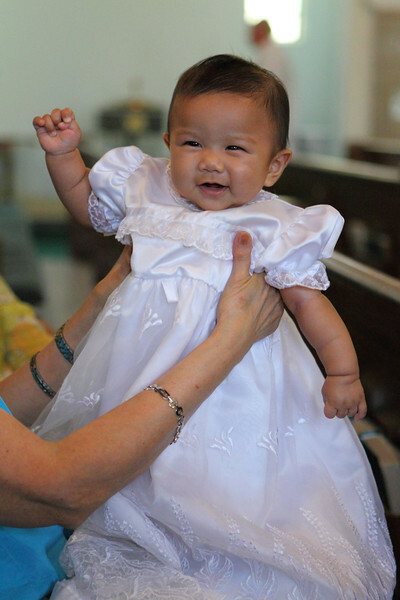 My son and daughter are no strangers to the Holy Sacraments. They share the same desire for Salvation and the eighth Sacrament, Apple iPhone Apps. Serena is on her way to Apple device addiction starting with her virtual babysitter, the Apple iPad. 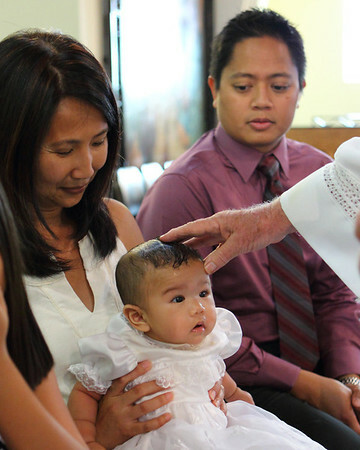 Anointing Oil introduces Serena to the Sacrament of Baptism as well as her Godmother and Godfather. The oil and with the help of her sponsors grease the wheels of Serena's life. 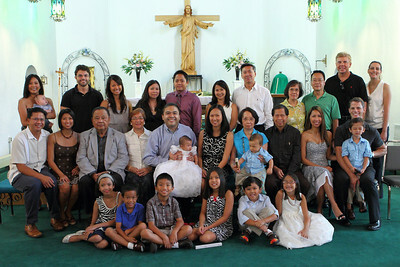 Baptism number three accomplished. Group family photos completed. 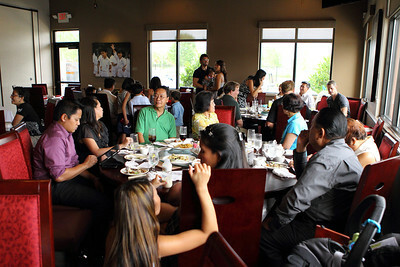 Now for the Baptismal reception at the new family favorite, Yummy House China Bistro. A great reason to celebrate is a great reason to feast. 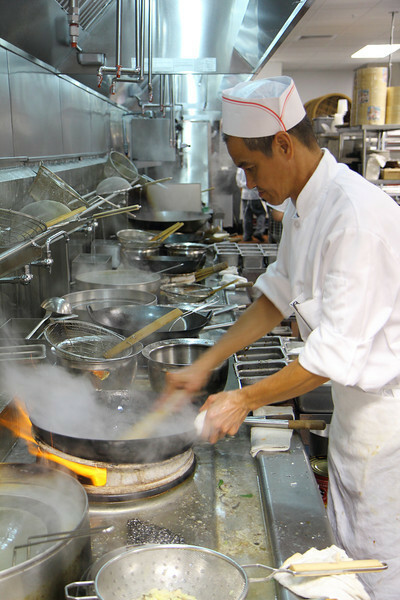 Hong Kong style Chinese cuisine and Cantonese style Dim Sum to be exact. Family and friends sharing a fabulous meal make fond memories. Sweet and Sour Fried Grouper with Honey BBQ Sliced Pork make even better memories. 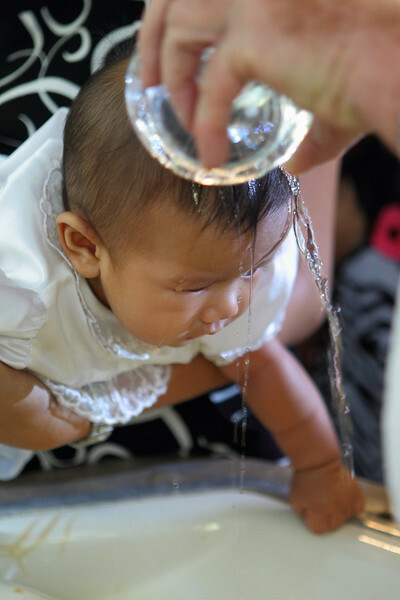 This Baptismal experience brought to you with my Canon EOS 1D Mark IV paired with the Canon EF 24-70 f/2.8L lens. With the great help of GetAwayMoments and BTW is the Godfather of my son, I was able to be in my own photographs this time. Finally! 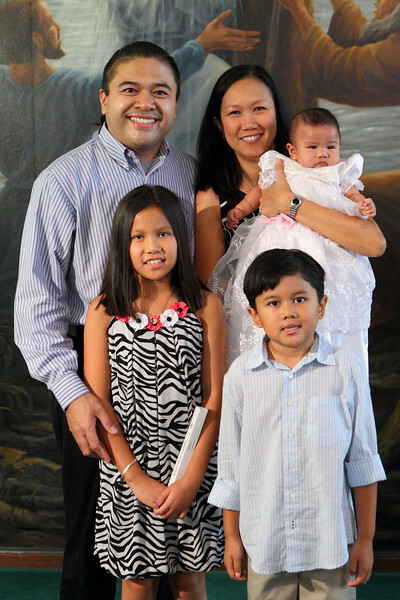 You can view more photos in Serena's Baptism 2011 Gallery. The Stars and Stripes are big and bright. 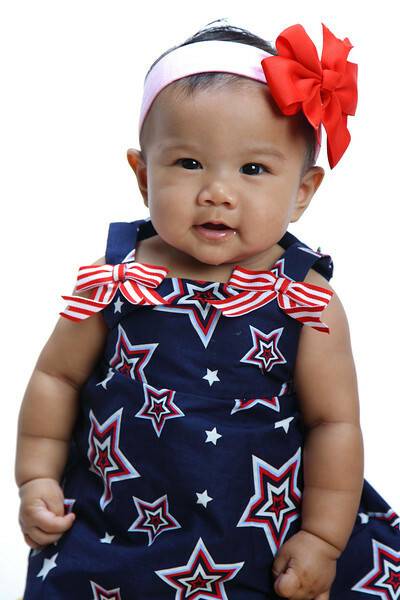 My newborn daughter is four months old on this very Independence Day. A celebration of a nation and the many milestones of Serena. 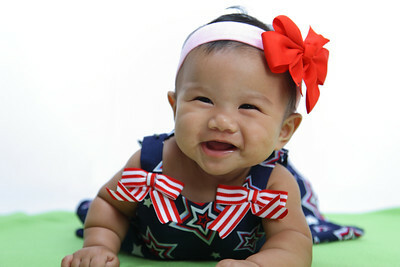 The laughing, giggling, smiling and rolling over on her tummy runs deep in the hearts of her mom and dad. 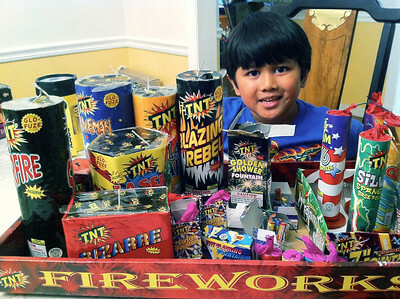 Only if milestones could explode and cause pyrotechnic havoc, my son would pay more attention to more sentimental occasions. This is the extent of my firework photography. Grilling ten pounds of meat and conducting the explosive celebration was not conducive to image making. There is no doubt Serena looks like her mom and her big sister. My oldest daughter loves her baby sister with all her heart. The uncanny resemblance is unmistakeable. Check it out yourself. Every month from now we will see Serena grow and her family glow with anticipation. I could very well see an Apple i-device in her future, pink of course. Serena is poised to crawl east on Hillsborough Avenue towards her favorite restaurant. Just follow the trail of slobber and spit-up. You can view more pictures shot with the Canon EOS 5D Mark II in my Serena on the Fourth of July 2011 Gallery. Stay updated with the latest HD DSLR gear by becoming a Fan on my Facebook Page and following me on Twitter. A family favorite has spread its wings and landed further east to nurture and feed hungry souls in Tampa, Florida. 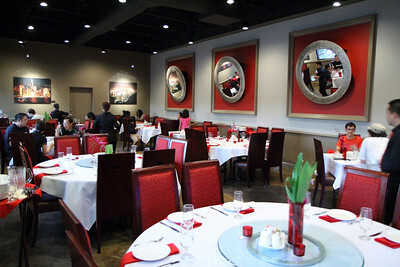 A wonderful addition to the already famous Yummy House on west Waters Avenue, the new and upscale Yummy House China Bistro on east Hillsborough Avenue opened its glorious doors this week to fans of Hong Kong style Chinese cuisine. Yummy House China Bistro has a challenge to live up to the outstanding reputation of the original Yummy House Chinese restaurant in west Tampa. I have a lengthy history of family events held at this culinary establishment. Birthdays, Father's and Mother's Day, Anniversaries and everything in the Hallmark calendar catered to Yummy House believers. The crowd gathering at the Waters Ave strip mall signified convinced stomachs coming back for more. Will upscale expansion hurt my Asian taste buds? 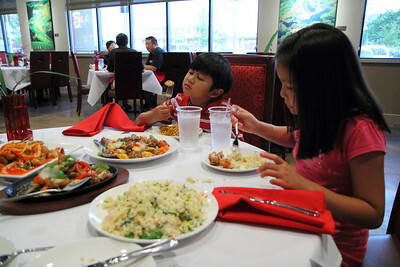 The mouths of many converged at Yummy House China Bistro across the street from the Sanwa Farmer's Market to find out. Wipe the drool off your face now. 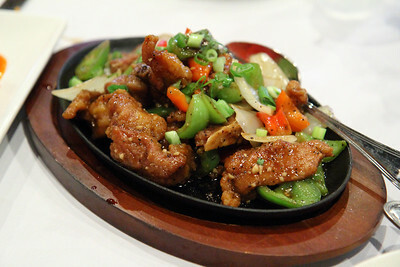 Remember this Sizzling Pork dish along with other Yummy House classic plates like Salt and Pepper Calamari. Yummy House China Bistro has unique entrees on the menu to make your eyeballs big. The family devoured the Sweet and Sour Fried Grouper chased down with the Hong Kong Sirloin with stir fried vegetables including Mango slices. Yummy! Meet my fellow food critics. Eating is their number one specialty. Consumer electronics and every Apple Computer device are secondary. Whining is a close third. The food items on the menu we ordered were just splendid. My kids agree wholeheartedly. Equivalent or better than the original Yummy House on Waters Ave in my opinion. All this Chinese goodness comes at a higher price on the wallet. Not an outrageous increase but only a slight contrast to the value priced original Yummy House on Waters Ave. You pay for the ambiance. The new building, the increased staff and the new Asian contemporary Darren White interior design of just a bigger restaurant. I think you can fit three original Yummy Houses just in the main dining area. Ultimately, you have a financial dining choice of either the value priced Yummy House or the more upscale Yummy House China Bistro. You will not be disappointed either way. 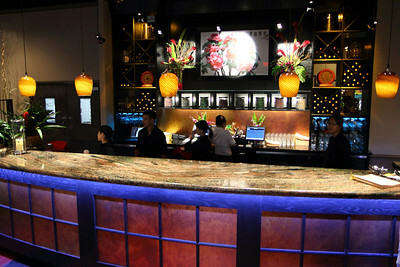 The fabulous cuisine comes from chefs and food staff transplanted from San Francisco, New York and Las Vegas. 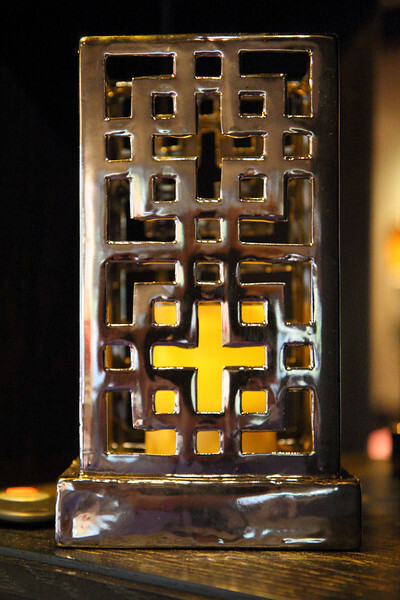 Attention to detail is seen by the custom made kitchen equipment from Hong Kong. 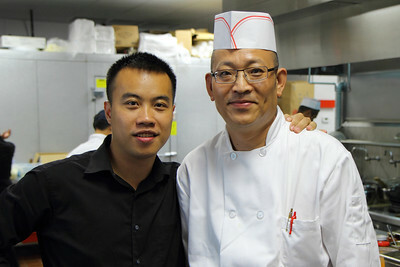 The masterminds and owners of Yummy House China Bistro are John Zhao and Executive Chef Tommy Tang. They have their hands full quite literally. 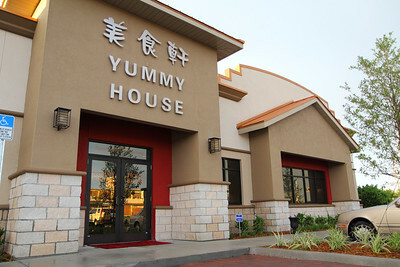 The original Yummy House on Waters Ave will remain open to West Tampa. Yummy House China Bistro welcomes the new fan base north of Ybor City and Seminole Hard Rock Casino and Hotel down the street. The good news Yummy House China Bistro has Dim Sum. The bad news is the Cantonese style Dim Sum is traditionally only for lunch and not dinner. 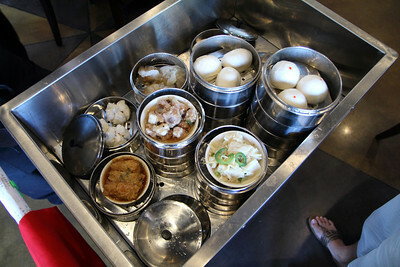 The plates of steamed goodness in metal baskets will tempt you as they are pushed in rolling carts next to your table. From the familiar Shu Mai and Honey Glazed BBQ Pork Buns to sweet Crispy Fried Sesame Balls and Hong Kong Style Egg Tart, you will go Dim Sum crazy with the selection. 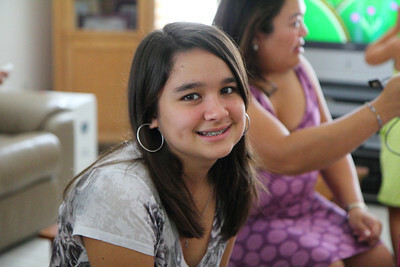 I could barely eat all the delicious food and shoot HD DSLR video with my Canon EOS Rebel T3i/600D at the same time. I managed to shoot a quick look inside Yummy House China Bistro handheld with the T3i paired with the Canon EF-S 17-55mm f/2.8 IS lens. The 1080p video was shot at 29.97fps and edited with iMovie'11. I used Quicktime to compress a 499mb H264mb video file. My shutter was at 1/60th, aperture at f/2.8 and my ISO was all the way up to 3200 at times. 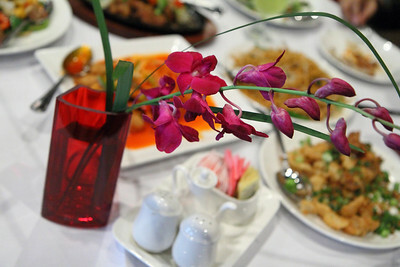 You can view more Canon EOS Rebel T3i/600D pictures and videos in my Yummy House China Bistro Experience Gallery.